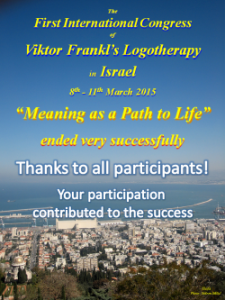 The Otsmot Institute, the Viktor Frankl Center for Logotherapy in Israel, has been active for 20 years, and combines within its practicable teaching framework a variety of multi-disciplinary approaches linked with the behavioral sciences. Through the perception of man as a single holistic entity, we are linked to a wide array of approaches in which the common denominator leads to the personal meaning of human life. Development of personal abilities for the sake of coping better with the difficulties that face a person and for discovering and strengthening the unique personal strengths that reside in everyone.